Enjoy the adventure of a lifetime with a Champagne Balloon Flight over beautiful Orlando, Florida and see the area as you’ve never dreamed. You’ll see the sites of Orlando from a birds eye view as you float lighter than air among the clouds. 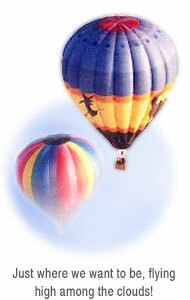 You’ll enjoy the morning air as you watch the beauty of the balloon take shape and prepare for flight. Your adventure continues as you step into the basket and begin your trip above the tree tops. After touch down you’ll enjoy a champagne toast as you and the crew talk about the flight. The cost of this great adventure is just $325.00 per couple ($475 per couple to guarantee the basket to yourself(s), or $175.00 per person (single). Ages 8 to 80 plus can enjoy the ride and we can accommodate parties up to 100 plus (there are some weight restrictions of course). Contact Us today to book your flight!